HOUSTON, (Horseback) – The director of the federal Bureau of Land Management personally gave a thumbs up to go ahead with a Nevada “gather” of wild horses. “The decision to proceed with the Calico gather after Judge Friedman’s ruling was made by Winnemucca Field District Manager Gene Seidlitz with the concurrence of BLM-Nevada State Director Ron Wenker and BLM Director Bob Abbey,” said BLM National spokesman Tom Gorey. Friedman ruled that the agency practice of holding captured mustangs in large holding facilities is likely against the law and that it would be ill advised to proceed with the “Calico Gather” which was planned for December 28. Abbey clearly felt otherwise. Gorey said the agency would have no further comment on its director’s decision to go ahead with the action which has drawn criticism from coast to coast and international press coverage in a perfect storm of protest by wild horse lovers. “Judge Friedman’s decision of Dec. 23, 2009, speaks for itself,” Gorey said. “The BLM has no further comment to make about the ruling, particularly since this legal matter is still under litigation,” he told Horseback Magazine. The roundup began on Monday as planned and BLM barred press and public from witnessing the roundup. On Wednesday, the BLM escorted a small group of journalists to the site to observe the horses in a very controlled media event. Wild Horse advocates claim that in the BLM roundups horses are stampeded down mountainsides, injured, and killed as they run from a roaring helicopter flying at low altitude. Horseback Magazine has repeatedly asked to witness BLM gathers, including the Calico, on horseback. BLM has denied the request. Parts of the roundup are held on private land. “The reason we have parts of it on private land is because it is the only way to have access to the horses for certain areas. They are really rough areas to get to. The private land is the only way we can get in there and get to them,” said BLM spokeswoman Heather Emmons. The BLM denies that any horses are being removed from private property at taxpayer expense. Such removal would likely require reimbursement of the federal government by landowners for removing the horses. Many western ranchers view wild horses on their land as competition for their cattle. BLM has refused to divulge the name of the property owner(s) whose land is being used for the gather other than to say it is not taking place on nearby Indian land. Horseback has also repeatedly sought an interview with Abbey but has been refused. In 2008, 45 percent of the roundups resulted in at least one fatality, and on another roundup in Nevada, 27 horses died. The total number of deaths through injury or for other reasons totaled 126 animals last year. The percentage of dead horses on BLM roundups this year is slightly worse at 46 percent resulting in at least one horse death. In July, a Wyoming gather proved fatal to 11 horses. Through September of this year, 79 horses have died as the agency rushes to clear wild horses from the West. Over the last two years a total of 205 horses have died at the agency’s hands during its “gathers” to thin the herds despite the almost 260 million acres of vacant land managed by BLM. Wild horse advocates claim the BLM roundups are genetically bankrupting the herds to the point of extinction. The horse habitat set aside by the 1971 Free Roaming Wild Horse and Burro Act is coveted by ranchers for grazing land who sign leases at fire sale prices of $1.35 per cow per month. A powerful statement to end the year with. I have nothing but sorrow in my heart. Thank you for all you have done and I keep hoping that things will change and my small contribution will somehow help. Every little ray of light and word of advice/encouragement is a help to the horses. They have brought us together, for a reason and that reason is to affect change, positive change. And while bringing that change about we are increasing the general public’s awareness of the wild things that we need to protect and cherish. Everyone with compassion in their hearts and with eyes wide open is making a difference. Human decency is the root of the entire problem–Gorey’s and Abbey’s. I wish one of these guys had a shred of a moral compass and stepped up and did something because it was the right thing to do–instead of the fact that they planned to do this roundup and by gum they’re going to do it. We need more Harry Trumans around who are willing to do the right thing and be willing to stand behind their decisions. Are you listening Barack? You folks have seen it in my writings and it is NOT fiction. While Terry and I were out in Montana, during the Cloud gather, we asked a (unnamed) BLM official why were they doing this. We had a pictures that the horses were fat and happy, there was plenty of grass…why, oh why would you do this. And in front of three of us, the response was “Because we can!”, and a mean grin surfaced. I kid you not, factual to the bone and it scared the living daylights out of me as I have been blessed by not facing such evil, face to face, ever before. But there it stood, right in front of me. It was sobering and Terry and I will never, ever forget it….but it backfired as we now KNOW that we are right to do what we do. We have to save the horses from the very real evil. There is no logic, sense or a shred of human decency in the BLM and it is rotten all the way to the top. I echo, are you listening Mr. “Change” President? In their minds there is logic and sense to that statement – its the scummy “do onto otheres before they do onto you” types! Sociopaths have no human decency – they don’t have an inkling that we would NOT do onto them other than what we would do onto ourselves – its not comprehendable to them – may as well be talking to a rattle snake or a wall. I’ve known too many of these types. Its very sad for them actually. And as I’ve said before way way too similar to the TV show Criminal Minds bad guys! “Becasue we can!” – makes my skin crawl! There must be a reckoning one day! They will awaken one day and know what they have done, hopefully in time to do some damage control. Suzanne, I think, wrote a wonderful peice about making mistakes, and changing ones mind – understanding. Movie – Born Yesterday – says it all! And its kind of sweet and funny too. R.T. in regards to the BLM subject you spoke to at the Pryor Mtn roundup, I can add that I am sure the same person, (because the demeanor he displayed) was at the roundup meeting held in Billings, Montana that I attended two years ago before they planned a roundup then. It was delayed because of an illness of one of their officials but carried out this year. Anyway, at the meeting there was serious talk about possibly delaying the roundup for 6 months or so, so a valid study could be conducted as to their range conditions and negotiating with the Forest Service to open a bit more range for the horses. This individual made a comment that if was a valid statement and then lowered his head and spoke into the table more quietly, but because I was sitting close enough to hear him, he said “WE ARE STILL GOING TO HAVE THIS ROUNDUP” Very discusting to say the least. This is Jim Sparks who is a head of the mustang office in Billings and has made many other typical BLM comments. It is very unsettling to me and I gather many others of us how they continue to sugar coat their comments. By the way–I am not trying to be political here. I voted for Obama–now I’m not sure why. I’m from Missouri originally, so Truman’s honesty and integrity is ingrained. “With every roundup, our west is less wild” Keeping wild horses on our rangelands protects the last of our wild open spaces. Remove them, and our last frontier gets smaller, and eventually replaced by concrete and stripmalls. Keep our wild horses in OUR west, and not shipped to arificial preserves to the east, or the tables of Europe… “Together THEY stand. Divided THEY fall”. Whether wild or part of our western heritage as we settled this great nation, they are LIVING LEGENDS, and we need to use our voice for them. All I know is all this killing must stop. We must stop killing each other and the animals that God gave us. When we domesticate animals for our own purposes and pleasures we are accountable for their well being. When we start taking land away from the wildlife where do we expect them to go. 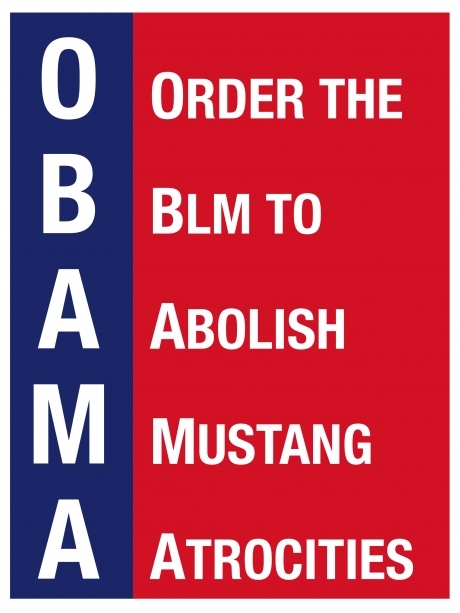 I didn’t vote for Obama, but if he expects any respect from me, he should start with the military and the mustangs. Denise – Excellent comment – right on! I did vote for Obama, but becoming very disappointed, but I’ll give him at least the same time as the last guys first term before I make up my mind! He does have a bit on his plate – the only way we will make it to his plate are actions like yesterday and this week – protests, media attention, keep writing, calling, seeking new advocates. Just tell the facts over and over and over. here’s that quote for you…. the cattle have been pulled from the range because of the overpopulation of horses eating the vegetation??? huh. i don’t think so! lying muthas. it’s because of the overpopulation of the damned cattle on the range that’s causing the lack of vegetation. sheesh. So glad to see this topic getting this exposure too. After seeing “Food Inc” a couple of months ago, I easily swore off all non source-verified meat,(that includes fast food, McD, most restaurants, grocery stores). One of my sources now is a family ranch in Montana that has only grass-fed angus, no hormones nor antibiotics, and is raised in the Mussleshell valley; and the other is in my town, a museum ranch that raises beef to support the museum. All farming and ranching is done as it was in 1880–no extras added! Gardenbelle, Ammonia – good grief Matilda – we are eating ammonia! Keep trying, I’m sure you will get some converts for thier own good. I tried for a while, but my doctor put me back on some red meat and lots of other meat protien, my particular system for whatever reason, couldn’d do it. But I have recently bought some Quinoa – its really good and supposedly a perfect protien without the side effects of legumes. But, I’m mostly on pork, eggs, cottage cheese, fish and chicken anyway, and try to get as much organic as possible. Will be looking for Bison next week. I know, from the nutritionist my past employeer hired to make us all healthier, that ANY PROCESSING is BAD. Should be avoidied whenever possible, including salt – “unprocessed sea salt”, my MD confirmed to me, actually LOWERS blood pressure – but not all salt sold as unprocessed really is, I’m still tryng to figure that out, and some say depends on where it is from. But, cattle, chickens, pigs, they are all being raised in inhumane methods, and to think all those antiobiotics they get – those bugs are just going to mutate – in the mean time we are eating the same antibiotics, and only God knows what else. It sure is a different world than even 20 or 30 years ago, so much different than 40 – 50 years ago! Could be again. I fear greed, the almighty profit at any cost, will do us in. Watch documentary – Food, Inc. It sounds like you have health issues, like me, that food can make better or worse. I’m very lucky that I am able to cut out meats, and get my protein other ways. I would never ask or expect anybody else to go to that extreme. Because it is extreme! I do eat eggs and milk and have been trying to find a local source. By the way, I found another video series called Meat the Truth. It’s geared towards the effects of corporate livestock production on climate change based on science. Very Interesting! As you can tell, I don’t give a hoot about cattle….and when they are on public property, I want them gone to make room for something that is beneficial to all of us. CNN has shown itself, by last nights report, to be whooly owned and controlled by “corpoorate” america. No doubt left in my mind! Just one propaganda rhetoric advertisment for some profeteers interest after another – I can come to no other conclusion at this time. I could not figure out how to comment – but comments to tell the real truth are surely needed on that blog! “Running horses in winter is less stressful than summer”? – Abbey, you would be so entertaining, if it was not so cruel and stink of cow pucky. Abbey, dude, running horses that far anytime of year is just plain cruel. And winter, when they should be as still, conserving energy for the cold as much as possible? And you ran them “slow”? We all can see the horses rounded up Monday, long winter coats soaking wet from sweat, left to endure a freezing night! I had, what I fear, to be a longline of unrestfull nights ahead, tormented by that sight! Not what I had hoped for New Years Eve. And “the snow is softer on their feet”? Abbey, rocks do not get softer when you step on them under snow because you could not see them! Thanks to all the protesters and your valiant efforts to get the true story out there! Good Night America – are there any real news reporters out there anywhere! Why YES, Knapp, Klienert, Stephen Long, etc.! I like to think Democracy Now and News Hour – but they will not respond to my many requests to join this story! Can we get that clip from Abbey with inserted flashes of the picture of the horses from Monday plastered all over YouTube with a true story? If they try to huddle together for warmth will their coats freeze together and pull out if they try to move? Horse folks, please tell me this is not so? – No, tell me the truth! Thats part of what I drempt in what little sleep I could get. Where is HSUS and others? Apolgies, don’t read further if your easily offended by cursing – “GDI”! RT you can just cut this part out if you feel it is too offensive. ps the judge is supposed to dictate to the BLM; not the other way around ! Will you please respond to my question with a simple yes or no, this is all I ask. Are you listening to the tens of thousands of voices united as one to save America’s wild horses? You have done it again! Superb post.